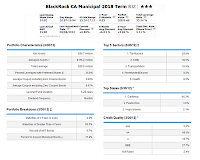 These Best California Municipal Bond Closed End Funds of 2012 are Nuveen CA Quality Income Municipal, BlackRock MuniHoldings CA Quality, Nuveen CA Performance Plus Municipal, etc. These CA municipal bond funds invest mainly in tax free CA municipal debt obligations. There are two types of bond closed end funds. They are tax free bond CEF and taxable bond CEF. The tax free fixed income fund invests mainly in municipal bonds. These muni bonds are obligation issued by a state, city, local municipality for governmental needs or to finance specific public projects. One of the advantages in investing in this fund is investor will get an income on regular basis which is exempted from federal income tax. The California municipal bond closed end fund invests mainly in California state municipal debts. These CA muni bond funds also provide tax free income from federal and California income taxes. The Nuveen California Quality Income Municipal fund objective is to provide current income exempt from federal income taxes and California personal income tax. It invests most of assets in a diversified holding of tax-exempt investment grade California municipal bonds. This Nuveen CEF is managed by Scott Romans. This best California municipal bond CEF has $514 million of total net assets. Its effective leverage is 37.70%. The fund market price trades 3.52% premium to its net asset value. The fund has a yield of 6.26% per year. Based on the highest federal tax rate of 35%, this 6.26% yield is equal to 9.63% taxable equivalent yield. It also has an expense ratio of 1.71%. This muni bond fund is introduced to public on November 20, 1991. 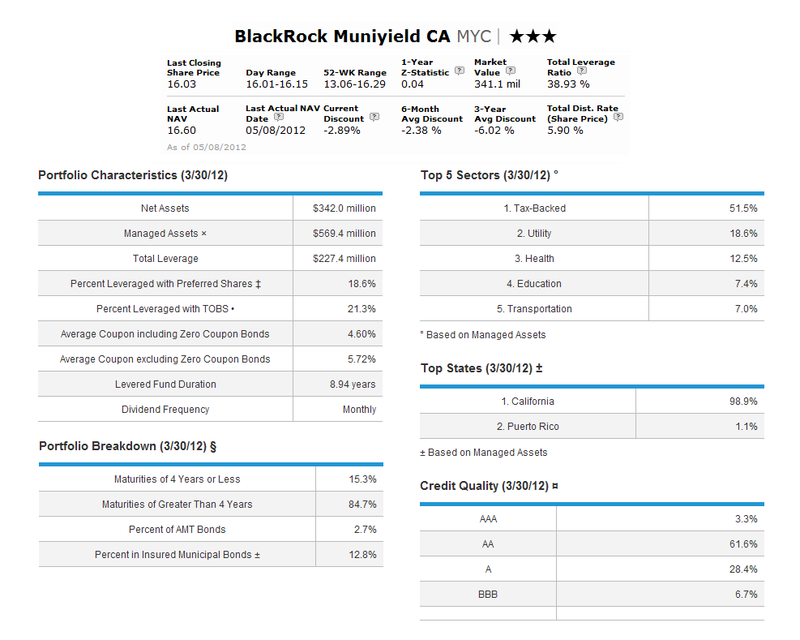 Morningstar has ranked this California muni bond CEF with 4 stars rating. It has year to date return of 7.49%. This bond closed end fund has returned 18.48% over the past 3 year, 7.55% over the past 10 year. As of March 2012, the fund has an average duration of 13.80 years. The top 3 sectors are limited tax obligation (23.70%), US guaranteed (18.11%) and health care (17.36%). 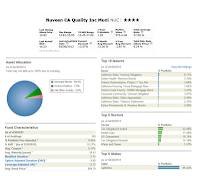 This Nuveen California Investment Quality Municipal fund utilizes its assets to buy tax free California municipal obligations rated within the four highest investment grades. It may invest in unrated California debts. This bond fund has 6.22% yield. This yield is distributed on monthly basis. The total net assets are $308 million. Its expense ratio is 1.74%. This top CA muni bond fund has a 5 year annualized return of 8.77%. It is rated with 3 stars. The fund average maturity is 20.26 years. As of February 2012, the AMT % is 0.68%. The average bond price is $94.48. The top 5 sectors include limited tax obligation (26.33%), general tax obligation (18.60%), health care (14.80%), transportation (7.46%), and water & sewer (7.45%). The Nuveen California Select Quality Municipal fund is being ranked with 5 stars by Morningstar. Its annual expense ratio is 1.64%. The total net assets are $530 million. Scott Romans is the fund manager. This fund has YTD return of 9.62%. The fund has an average duration of 14.92 years. Its top 3 holdings are: California State General Obligation Bonds 6% 6.00 01 Nov 2039, California Statewide Cmntys De Rev Bds 6.00 15 Aug 2042, San Diego California Pub Facs Fing Sr S 5.25% 5.25 15 May 2025. The top 4 sectors in its portfolio are limited tax obligation (20.68%), general tax obligation (19.81%), health care (19.24%), and water & sewer (8.27%). The investment aim of BlackRock MuniYield California fund is to provide investors with as high current income level exempt from federal and California income taxes as is consistent with its investment policies and prudent investment management. This BlackRock CEF uses its assets to buy long term municipal bonds the interest on which is exempt from federal and California taxes. The fund managers are Walter O’Connor and Theodore R. Jaeckel, Jr. This best California municipal bond fund is ranked with 3 stars. It has market value of $340 million. The total leverage ratio is 38.96%. The total distribution rate is 5.94%. This fund has returned 18.78% over the past 3 year, and 8.60% over the past 5 year. As of May 8th 2012, the market price is trading 3.33% discount to its NAV. 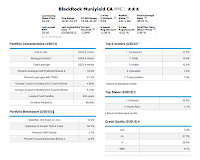 This BlackRock MuniHoldings California Quality fund has total leverage ratio is 40.82%. It also has market value of $646 million. This California municipal bond fund is rated with 3 stars. The yield is 5.98%. The expense ratio is 1.38% per year. It also has YTD return of 8.63%. The investment objective of BlackRock MuniYield California Quality fund is to provide tax free current income from U.S. Federal income tax and California income tax. It invests its assets in portfolio of insured investment grade municipal bonds. Its expense ratio is 1.49%. The fund average maturity is 20.79 years. As of January 2012, this best muni bond fund has 131 holdings. The annual portfolio turnover rate is 26%. The top 2 sectors are long term municipal bond (54%), and municipal bond (44%). Its 10 year annualized return is 7.57%. To buy this best closed end fund, you can use any brokerages such as TD Ameritrade, Fidelity, Scottrade, Firstrade, etc. You can purchase as little as 1 share of this CEF. As part of municipal bond CEF, this Nuveen California Performance Plus Municipal fund invests majority of assets in investment grade tax-exempt California muni bonds. This bond fund has total net assets of $282 million. Its distribution rate is 6.25%. This yield is paid monthly. This top performer muni bond CEF is ranked with 3 stars. In 2008, this fund has an annualized return of -25.97%. It has returned 32.42% over the past year, 7.78% over the past 5 year, and 7.23% over the past decade. The average credit quality of this fund is A (investment grade). 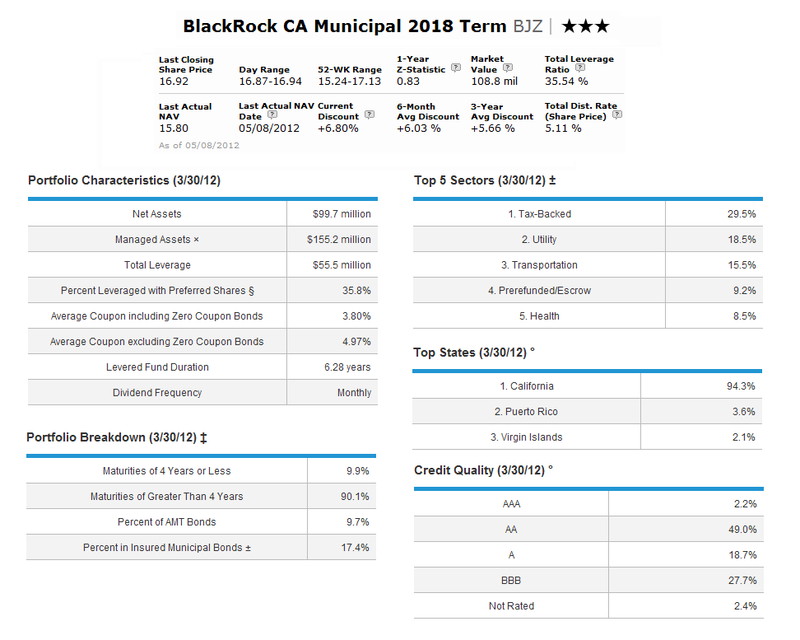 The BlackRock California Municipal 2018 Term Trust fund focusses its investment in investment grade quality municipal bonds. Its objective is to provide tax free monthly income from federal and California income taxes. The total net assets are $157 million. The tax equivalent yield is 7.85%. It has returned 11.20% over the past 3 year, and 6.81% over the past 5 year. The average coupon in its portfolio is 3.88%. The annual holdings turnover rate is 28%. As part of AllianceBernstein CEF, this Alliance California Municipal Income fund is managed by Terrance T Hults since 2002. The 12 month yield is 6.03%. The total expense ratio is 1.40%. There are 74 holdings in its asset.